Neurosurgical Consultants: Getting Ready for Surgery: What should you expect from the Hospital Facility? Neurosurgery is one surgical specialty that is highly reliant on advanced technology as well as dedicated facilities staffed by specially trained and qualified technicians. What follows in this section is a review of some of the types of dedicated facilities that one would expect in a hospital with a significant interest in Neurological Surgery. Part of the challenge for the Neurosurgeon to achieve the best outcome possible for the patient is to identify, as accurately as possible, the precise nature and anatomical configuration of the pathological condition and its relationship to vital adjacent structures(such as blood vessels, nerves, etc.) The advances in the last several years in diagnostic and therapeutic technology have resulted in far greater accuracy and improved outcomes for Neurosurgical patients. Neuroimaging is the term applied to techniques that allow us to inspect the Brain/Skull, Spinal Cord & Nerve Roots/Spinal Column without making any incisions. (NOTE: ALL OF THIS IMPORTANT INFORMATION IS REVIEWED ON THIS WEBSITE). Figure 1A (Left): 3-D MRA (Angiogram). MRI technology combined with sophisticated computer software permits a 3 dimensional reconstruction of the Skull and blood supply to Brain. Figure 2B (Right): 3-D reconstruction image of a child with premature closure of cranial sutures. 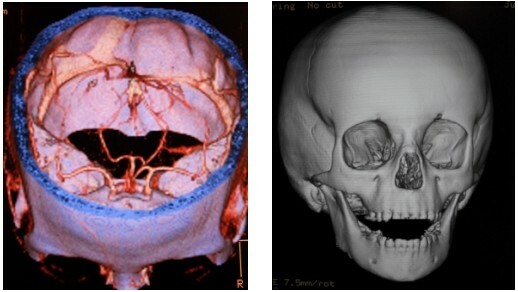 This imagery is created using CT technology and is useful in pre-operative surgical planning for Skull Base Tumors as well as for Craniofacial Surgery. These advanced technologies incorporate Non-invasive as well as Invasive methods. Among the Non-invasive techniques Magnetic Resonance Imaging (MRI) and Computed Axial Tomography (CAT or CT) are two of the most advanced neuroimaging systems. MRI has the capacity to evaluate "soft" tissues (Brain and Spinal Cord) in a superior manner while CT is superb for evaluating Bone Anatomy. Each technique has overlapping capabilities. Both of these technologies incorporate computer-driven capabilities that permit the investigation of the blood supply (angiography) to the Central Nervous System (CNS= Brain & Spinal Cord) as well as some ability to examine the actual FUNCTIONING of the Brain. 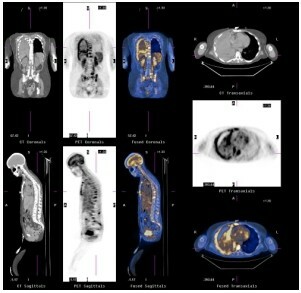 The amalgamation of CT Scanning with Radioisotope methods (a technology called Positron Emission Tomography/CT or "PET/CT"). Occasionally your surgeon will need information from all of these technologies in order to completely evaluate the problem. Figure 2: PET/CT Scan. This technology incorporates radioisotope imagery combined with CT Scan to render images that are useful in the evaluation of Cancer patients. There are several INVASIVE technologies that are used as well in selected patients where the Non-invasive methods fail to give the level of information deemed necessary. Neuroradiologists use Invasive Arteriography to provide additional vital information about the Blood Supply to the Brain & Spinal Cord and/or the Tumors that affect them. Interventional Neuroradiologists use this same avenue to treat Vascular CNS problems as well as some Tumors. Myelography with Post-myelographic CT Scan is another Invasive technique that can provide invaluable information regarding certain Spine problems. Figure 3A (Left): Cerebral Angiogram of a Right Posterior Frontal Lobe Arteriovenous Malformation (AVM). The precise anatomical configuration of the Blood Supply to and Venous "Aneurysm" (Arrow) draining the AVM is provided by "Invasive" Angiography. Figure 4B (Right): Post-operative Angiogram of a successful treated AVM. Microvascular surgical techniques were used to remove this AVM. Two Aneurysm Clips were used to control large arterial branches feeding the AVM. Two metallic "Hemoclips" were used to control the large Venous "Aneurysm" (Arrow). 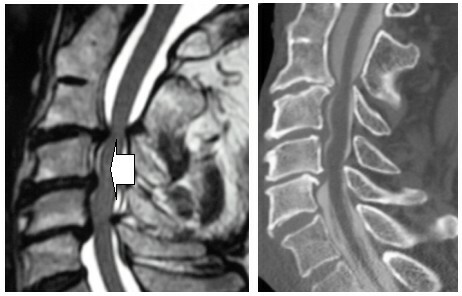 Figure 4A (Left): Cervical Spine MRI Scan of a patient with advanced Degenerative Arthritis (Spondylosis) at multiple levels. The MRI indicates a small area of Spinal Cord injury (the faint white image in the substance of the Spinal Cord at the C4, 5 level indicated by the Arrow). The MRI Scan is able to give greater details of Spinal Cord and Brain anatomy than CT. Figure 4B (Right): Post-myelographic CT Scan (Same patient). The anatomical detail of bone, bone spurs and calcified Posterior Longitudinal Ligament is far greater on this study than on the comparable view of the MRI Scan. The Operating Room environment is no less dependent on advanced technology. Whether it is the very latest in Image Guidance (a type of Global Positioning System-GPS [see Figure 11B] similar in concept to that used in modern day automobiles for determining precise geographical location), intra-operative real-time imaging (MRI/CT/Ultrasound/Fluoroscopy), high level optical magnification systems (Operating Microscopes/Neuroendoscopes) or powerful ultramodern Ultrasonic Tumor Resection instruments, all these advances make for improved technical results and improved quality of life outcomes. 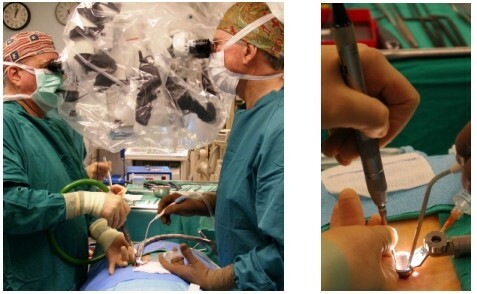 Figure 6A (Left): Operative Photo of Neurosurgeons performing a Minimally Invasive Microsurgical Lumbar (Spine) Laminotomy. They are using a LEICA Neurosurgical Operating Microscope. 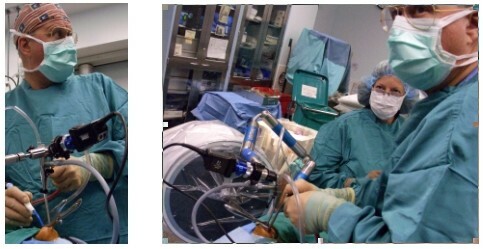 Figure 6B (Right): Operative Photo, "close-up view" of the Minimally Invasive (Medtronic-Sofamor-Danek, Inc.) tube retractor and special slender drill. 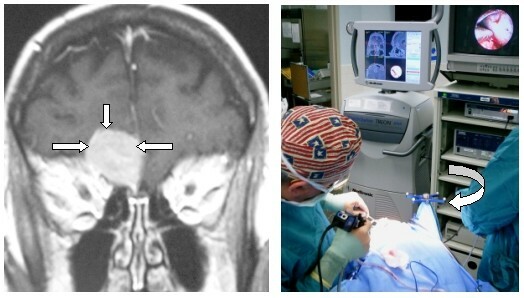 Figure 8B (Right): Operative Photo of an Endoscopic (Assisted) Image Guided (Arrow) Resection of this tumor through a "Keyhole" Craniotomy fashioned through a small EYEBROW incision. Neurosurgeons are now able to monitor critical neurological functions during the performance of neurosurgical operations even with the patient under anesthesia. Intraoperative Evoked Response Monitoring employs electronic techniques to measure special functions such as hearing, facial muscle control, vision, eye muscle control, facial sensation, motor and sensory function in extremities, etc. These techniques are critically important for certain types of operations such as the removal of Skull Base Tumors, and Microvascular Decompression(MVD) procedures. These adjunct techniques help the Neurosurgeon to prevent injury to critical functions controlled by vital nerves that are either directly involved by a pathological process or are in contiguity with the anatomical problem and are therefore at some risk to injury. An example is the very delicate technique critical to the management of Acoustic Neuroma, removal when attempting to PRESERVE HEARING function as well as FACIAL MUSCLE control. Figure 9A (Left): MRI Scan (Gadolinium Enhanced) of a Left Acoustic Schwannoma (Neuroma). The tumor occupies the Internal Auditory Canal (IAC) where it arises from one of the Vestibular Nerves and compresses and distorts the Cochlear Nerve (Hearing) and Facial Nerve (Facial Movement). Figure 9B (Right): Operative Photo of the Acoustic Schwannoma (Upper Arrow) arising from A Vestibular Nerve (Lower Arrow) after the posterior bone wall of the IAC has been removed. Figure 10A (Left): MRI Scan Post-operative resection of the Acoustic Schwannoma seen in Figure 9A. The tumor has been removed and the Cochlear and Facial Nerves have been preserved. The nerves can be seen entering the IAC on the patient's Right & Left sides. Figure 10B (Right): Operative Photo (same patient as 9B) immediately after the Acoustic Schwannoma was removed in this HEARING CONSERVATION operation. A small surgical dissector (Arrow) is reaching over the lower lip of the IAC. By way of example, we have a 30 year history of innovative utilization of Intraoperative Evoked Response Monitoring, which are electronic techniques that measure important neurological functions during Neurosurgical Operations. We work with specialists who have unique expertise with these techniques. Among these monitoring professionals are those from BIOTRONIC NEURAL MONITORING SPECIALISTS. Critically ill Neurosurgical Pre and Post-operative patients are best managed by specially trained and certified Neurosurgical Nurses in a dedicated Neurosurgical Intensive care Unit. These units are uniquely adapted to the needs of the Neurosurgical patient and are usually supervised by a specialist in Critical Care Medicine. Figure 11A (Left): Neuro ICU Photo. 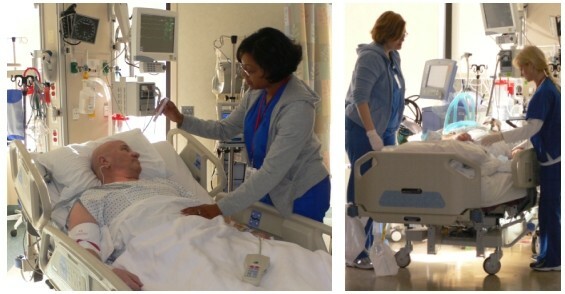 A Neurosurgical patient is being evaluated by a specially qualified Neurosurgical ICU RN. Figure 11B (Right): Neuro ICU Photo. Neurosurgical ICU RN'S work in teams in a state-of-the art dedicated Neurosurgical Intensive care Unit. Their work is assisted by different types of high level monitoring technology. 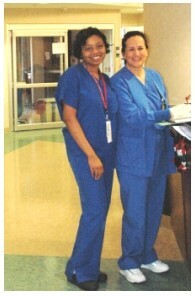 The length of stay for any particular patient depends on several factors including the Medical and Neurological condition of the patient, the type of surgery performed, the need for "invasive" monitoring (such as arterial lines/intraventricular or lumbar subarachnoid drains) and the requirement for "isolation" to protect the patient and/or others. Neurosurgical Nursing requires a very special skill level. The American Association of Neuroscience Nurses is an organization that certifies Neurosurgical Nurses who possess special expertise to care for neurosurgical patients. A hospital that encourages and employs these highly motivated and exceptional nurses with this skill level demonstrates its commitment to the neurosurgical program in that facility. Once again by way of example, our Neurosurgical Nursing Staff employs nurses skilled in the management of Neurosurgical problems and certified by the American Association of Neurosurgical Nurses.